In case you have not yet heard, the Cleveland Cavaliers, are not resting on having the best record in the NBA, and have decided, according to many media outlets, have acquired Shaquille Oâ€™Neal. 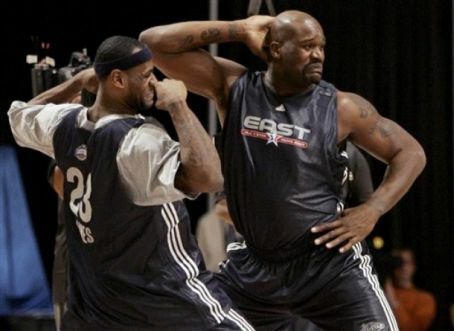 Shaq was traded to the Cleveland Cavaliers for Ben Wallace, Sasha Pavlovic, this yearâ€™s 2nd round pick (number 46 overall), and cash considerations. This gives the Cavaliers another big man so that they will be able to better compete against the Orlando Magic and other bigger teams. The Cavaliers also do not have to use a draft pick tonight on a taller player, and can go for a small forward, or another ball handler. The Cavaliers currently have a 5 man rotation of Zydrunas Ilgauskas, Shaquille Oâ€™Neal, Anderson Varejao, JJ Hickson, and Darnell Jackson. Shaq had a great year by averaging 17.1 points per game and playing in 75 games. He has returned, as this last year has shown, to his younger self. Shaq was recognized as one of the top 50 players of all time. He is 37 and has 1 year left on his current contract which he will make $20 million this season. Oâ€™Neal has been quoted as saying that he would like to play for 2-3 more years after his contract expires. This probably will not be the case for the Cavaliers. If the Cavaliers were to resign him after the 2009-2010 season, they would not be able to go after any other free agents who will be available in the much lauded 2010 offseason. By having Shaq, the Cavaliers are going for broke in trying to not only keep LeBron happy, but the fans. Ticket sales may even increase, as well as the number of nationally televised games to see this great 1-2 punch of LeBron and Shaq. Shaq is hungry for another title, especially after seeing Kobe win one without him a few weeks ago. Other rumors have been persisting regarding the Cavaliers. They have interest in Trevor Ariza from the Lakers as well as Matt Barnes from the Suns to take Sashaâ€™s place on the team. With the recent DUI of Terrance Kinsey, the next shooting guard / small forward player will have more playing time as Kinsey does not have a guaranteed contract for next season. The Cavaliers have many guards who are undersized players who are not pure point guards like Delonte West and Daniel Gibson. Both can defend but are not very consistent on offense. The Cavaliers are looking to adding length, as well as a pure point guard in tonightâ€™s draft. Currently the Cavaliers have the 30th pick overall.